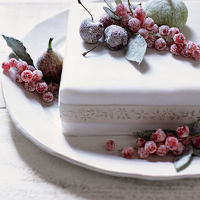 These frosted fruits can be used to decorate a Christmas pudding, too. Place on a tray lined with non-stick baking parchment and leave to harden and dry. Arrange on the cake. This recipe contains raw eggs, so it's not suitable for pregnant women, elderly people, or those with weak immune systems.